Chess Blog For Girls: Rules & Conditions for the 13th Annual Susan Polgar Foundation Girls' Invitational - the richest all-girls championship in the world! Rules & Conditions for the 13th Annual Susan Polgar Foundation Girls' Invitational - the richest all-girls championship in the world! The Annual SPF Girls' Invitational, in its 13th year, is the most prestigious All-Girls event in the United States. It is also the first All-Girls event approved and sanctioned by the USCF back in 2003. It is an invitational event, and will once again be held at Webster University (St. Louis, Missouri). Each state, as well as each country in the American Continent (South, Central, and North America) is allowed to nominate one representative. Each Canadian province is allowed one representative to be nominated. In addition, automatic qualifying spots will be awarded to the reigning winners in each section of the annual Susan Polgar Foundation National Open for Girls and the Susan Polgar Foundation World Open for Girls. Webster University will provide complimentary room and meal accommodation on campus for all qualifiers! 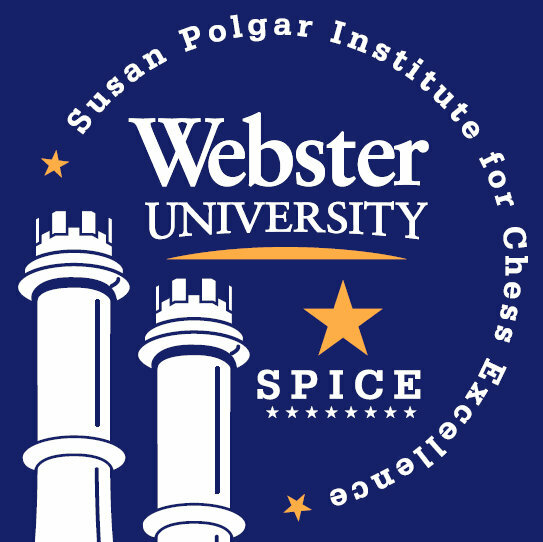 • There will be an intense training session with Susan Polgar and members of the SPICE team, followed by a 6 round (g/90+30) FIDE rated championship tournament. • The traditional Blitz, Puzzle Solving, Bughouse events will stay the same as in previous years. • There will be many chess prizes awarded, as well as scholarships to Webster University. Official representatives should be nominated by June 10, 2016. Official representative alternates may be substituted no later than July 11, 2016. (Susan Polgar and/or the Polgar Committee may allow the host state / country to enter an additional qualified player.) Susan Polgar and/or the Polgar Committee may allow exceptions to the June 10 entry/alternate deadline. Should the state / country affiliate fail to respond to the notice for this tournament, Susan Polgar and/or the Polgar Committee may determine the candidate from that state / country. Players must have been enrolled in a school (up to 12th grade) located in the state or country they represent, also of the year in which the tournament is held. Home-schooled students who are under the age of 19 on July 22nd of the year in which the event is held or students who have never attended college on a full time basis prior to June 1 of the year in which the tournament is held, are eligible to represent the state in which they reside. Exception: If a player graduates from high school early and is already attending college, she may still represent her state if nominated. This is the decision of each state affiliate or country. VERY IMPORTANT NOTE: The participants of the Susan Polgar Girl’s Invitational DO NOT have to be high school students. Any qualifier under the age of 19 (by July 22nd of the year in which the tournament is held) is eligible! Special invitation for this year: All past participants of the SPNI and SPFGI (Susan Polgar National Invitational/Susan Polgar Foundation Girls’ Invitational 2004-2015) are invited to participate in the 2016 SPFGI. The idea is to have the past participants learn my method of training so they can go back home and share their knowledge with the younger players. However, registration MUST be made ASAP since space is limited. There will be mutual training sessions for all, however separate section & prizes for alumni participants over the age of 19. Players are required to furnish the organizer an emergency phone number and the e-mail address of a parent/guardian. There is no entry fee to participate in the 2016 SPFGI; however, players are responsible for their own travel. For alumni participants, wild card/special invites, coaches, parents, or other family members, inexpensive accommodations are available for housing and dining on Webster’s campus. Please note that all reservations and registrations MUST be made (and accommodation expenses prepaid) no later than June 15, 2016. * The scholarships to Webster University must be exercised no later than Fall of 2019, and are not transferable. In addition, these scholarships cannot be combined with other academic scholarships, or stacked. If players won scholarships in past events, they can choose to exercise the highest one. Additional CASH SCHOLARSHIP this year! There will also be additional surprised prizes which challenge intellect and wit! The Polgar Committee’s goal is to have all 50 states (including two representatives for California, two for Texas, and two for Missouri), the District of Columbia, as well as each country in the American Continent (South, Central, and North America) represented. We strongly encourage each state and the District of Columbia affiliate to hold a scholastic championship tournament to determine each state’s champion and representative. Failing this, rating criteria may be acceptable. A scholastic girls’ champion or the highest rated girls’ scholastic player in a state who has no state affiliate of the USCF should contact the Polgar Committee as soon as possible. Susan Polgar and/or the Polgar Committee and its members may elect to award a limited number of wild cards each year for the Susan Polgar Girl’s Invitational. Special qualifying events: The Polgar Committee will award automatic qualifying spots to the reigning winners in each section of the annual Susan Polgar Foundation National Open for Girls and the Susan Polgar Foundation World Open for Girls. The SPFGI Chairperson is Martha Underwood (AZ). NOTICE TO ALL STATE OFFICIALS: Please send the nomination from your state to the Polgar Committee (PolgarCommittee@gmail.com). The Susan Polgar Foundation can be contacted at 806-281-7424 or through info@PolgarFoundation.org.